Tara Linda released her vocal jazzy blues CD "Torch and Sass" of all original material at the world famous Yoshi's Jazz Club in Oakland, CA. Her release was highlighted in the San Francisco Chronicle "Entertainment Picks", the Oakland Tribune "Weekend Top 10", the San Francisco Jazz Examiner, NPR's KALW "Arts & Culture", and went on to reach #29 on the CMJ Top 40 Jazz Charts with airplay on over 100 NPR & college stations. The Rumor Mill features guitar, drums, trumpet, fluegelhorn, saxophone, clarinet, bass, ukulele. Tara Linda has played world & roots music festivals to enthusiastic crowds across the world. She performed to an audience of 60,000 at the Zhou Jun festival in Inner Mongolia, while her show at the European Broadcasters' Union Folk Festival (Segovia Spain) was broadcast in over 30 countries and shown live on Spanish National TV : Tierrafolk praised "The Americans quickly won over the crowd. With a beautiful voice and accompanying herself on bass and accordion, Tara Linda filled the Segovia night with joy and frontier blues." 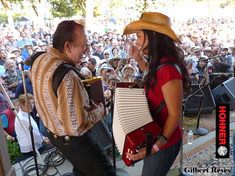 Tara's 3rd album, "Tortilla Western Serenade" garnered critical praise and charted in the top 20 on the national RMR, FAR and Euro-Americana radio airplay charts and was voted "FAR and Away Best Debut Albums of 2010" by the Austin, TX FAR charts. 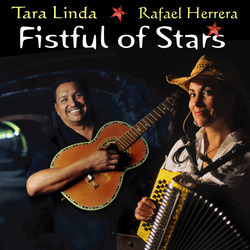 Tortilla Western Trio features accordion, guitar, percussion/drums, trumpet and bass, plus bilingual vocals by Tara Linda and Rafael Herrera. For private events, Tara Linda’s draws from her diversity of musical styles and extraordinary musicians to tailor a setlist appropriate to create the ambiance for your event. 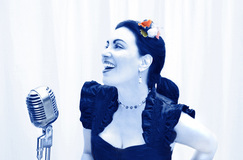 Tara Linda provides professionalism, unique music, and a warm and upbeat energy ideal for diverse-crowds including festivals, wine tastings, cocktail hours, dinner parties, etc. "bistro with a beat, hip and cool" Marcia K., Sonoma CA Winery tasting. In addition to public festivals, Tara Linda is available for Private Events & Parties - entertaining for movie premiers, wine tastings, cocktail hours, book releases, Cinco de Mayo, fashion shows, spa resorts, and charity galas.